Barf, I signed up with Global Cache and got the Micca codes sent to me, in Pronto Hex format (I assume you did the same). Is there a way to import this file "as is" into IRScrutinizer, without cut & pasting each code one by one? Now press "Import all", and press "OK" on the pop-up. You are now taken to the parametric remote editor and can do desired editing there. There are some nice stuff in the context menu. For example, the comments are pretty silly, you can nuke them by right mouse button -> "Clear all comments". Select the export pane. 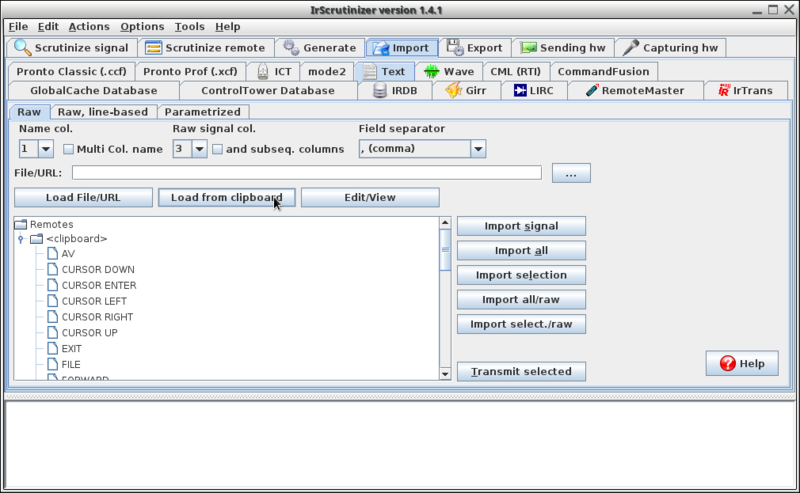 Select RemoteMaster as "Export Format", and press "Export param. remote" (the table we just manipulated was the "parametric remote"). The rest is covered in the Wiki article linked above. And for anyone else wanting to try to use IRScrutinizer for this purpose, when you first try exporting the generated RMDU file, you might have trouble finding where it got saved. There is a message on the screen saying where it is, but that folder didn't exist on my system. I did some poking around and eventually figured out what's up. What you need to do is go to the Export tab and notice the "Export dir." box, to the right of it is a box simply labeled "...", click on that and select the folder where you would like the RMDU to be saved, then go back and repeat the process to generate the RMDU and it will be saved there. Select the export pane. Select RemoteMaster as "Export Format", and press "Export param. remote"
Having trouble with this bit. I am running 1.4.1 but when I select the Export Tab and the then the Export Format drop down menu I get only 4 entries: Girr, Pronto/Classic, Text and Wave. No sign of RemoteMaster. What am I missing ? Probably you have updated an < 1.4 version. Try this: Select File -> Reset Properties. Then restart the program. ... when you first try exporting the generated RMDU file, you might have trouble finding where it got saved. There is a message on the screen saying where it is, but that folder didn't exist on my system. I did some poking around and eventually figured out what's up. What you need to do is go to the Export tab and notice the "Export dir." box, to the right of it is a box simply labeled "...", click on that and select the folder where you would like the RMDU to be saved, then go back and repeat the process to generate the RMDU and it will be saved there. The default for the export directory on Windows (something like %HOME%\AppData\Local\Temp\Export) is selected from official guidelines. If it does not exist, it is created when needed. If someone does not like it, it can be changed, as Rob describes. The changes are stored persistently. The "Open" button next to the "..." will open an explorer window on the selected export diretory. If unchecking "Automatic file names", there will be a file selector for each export, allowing arbitrary file paths. The "Open last file" (available both on the export pane as button and in the Action pull down menu (as "Open last export file")) will "open" the last created export file, just as if double clicked from the explorer. I think the problem in my case was that, at some point along the way, I renamed my JP1 folder, and I must have previously selected an output folder in IRS. So, when I tried exporting the RMDU file, it tried to save it in a location that didn't exist, but it didn't complain or tell me that was the case, so I just kept trying to find where it had been saved, and of course, it hadn't. So that's when I started the long quest of trying to determine where IRS was trying to save the file and change it.